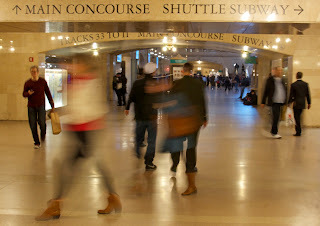 “You’re just two stops after us,” the woman semi-confidently told the group of tourists puzzling over their subway map. Since she was consulting her own map, I figured she was a tourist too. New Yorkers don’t carry maps. We just continually squint at the in-car maps when forced to venture to the exotic lands that lie on subway lines less taken. Maybe I shouldn’t have interfered with an adventure in the making, but my stop on our uptown-bound train was still a minute away so I stepped over and asked where the group was trying to go. Actually, I didn’t say that, though in retrospect it would have been funny, at least to me. Instead, as the brakes squealed I quickly explained that they had missed their stop when our train had unexpectedly gone express and skipped a few stations. At my urging the group followed me out of the train. In short order I led them past potentially confusing signage to the appropriate platform and then headed out alone into the sunny spring afternoon. Brief detours into nonprofit urban tour guiding like these always make me think back to an overheard comment a few years back in another capital city (whaddaya mean NYC isn't the capital?). I can’t remember the speaker’s name, but I remember his voice or at least the way he talked. He was kind of rough around the edges, with an authentic New Yawk accent – not the type of guy I was expecting to encounter at Kap’s Place, a guesthouse in San Jose, the capital of Costa Rica. But there he was along with the rest of us – either planning an adventure within the country or wistfully waiting for the flight home the next day. The woman at the desk at Kap’s had been amazingly friendly and efficient in handling multiple questions from guests, especially about finding our way around the poorly marked streets of the somewhat sketchy neighborhood. Unfortunately, she had gone off duty minutes earlier, replaced by someone who proved far less prepared to deal with information-seekers. When the New Yorker cheerfully asked for directions to the nearest bus stop, her response was far too vague for the neighborhood. He politely asked for clarification on his map, but all he received was a sullen look. I don’t know if the clerk understood him enough to be appropriately chastened, but I’ve never forgotten his words or the calm, matter-of-fact manner in which he delivered them. I have no doubt that New York meant what he said (and that he realized that the clerk was probably just having a bad night), though I doubt that he would have expected his words to be so memorable.